In the song Fela talks about Margaret Thatcher, P.W. Botha (the South African premier at the time of apartheid) and Ronald Reagan. "Botha now friends to Thatcher and Reagan, Botha now friends to some other leaders too. And together they want dash us human rights. Animal want dash us human rights. Human rights are my property. They can't dash me my property. Animal want dash us human rights. Give them human rights!" Knitting Factory Records will continue their reissue series of the complete works of Fela Kuti on 20 May 2013 with a second tranche of releases: ten CDs, most of them containing two albums, all re-packaged, and with fascinating in-depth track-by-track commentaries written by Afrobeat historian Chris May. This batch of releases includes albums with classic Fela tracks such as 'Zombie', 'Shuffering And Shmiling', 'VIP' and 'Coffin For Head of State', as well as lesser-known ones such as 'Stalemate' and 'Fear Not For Man'. It's now over 15 years since Fela passed away. In October this year, the Nigerian icon and Afrobeat originator would have been celebrating his 75th birthday. But to this day his legacy lives on across the globe with his still-relevant, forthright political views and powerful music. In recognition of Fela's burgeoning global stature, Oscar-winning filmmaker Alex Gibney is currently making the definitive Fela documentary, due for cinematic release in 2013. Also, a feature film of Fela's life and times is in the works with Focus Features, directed by Turner Prize and BAFTA winner Steve McQueen. Fela even made it to Broadway: the Broadway hit musical, Fela!, recipient of 11 Tony nominations and three awards, directed by Tony award-winner Bill T. Jones, with producer-backing from Jay-Z, Will and Jada Pinkett-Smith among others, continues to play in the world's most prestigious theatres. Currently touring the US with more dates planned for 2013, it features Michelle Williams, of Destiny's Child, as a recent cast member. To celebrate the forthcoming reissues Knitting Factory and AMGP will be hosting two Saluting the Black President parties in London (17 May) and Paris (16 May), featuring Ginger Baker (drummer and Fela collaborator), Tony Allen (previously Fela's drummer), Blak Twang, Afrikan Boy, BREIS, TY, Terri Walker, KOF and Shingai Shoniwa (from the Noisettes). The musicians, singers and rappers will offer their interpretations of Fela songs and will collectively contribute to a magical evening, aided and abetted by the musical backdrop provided by the inimitable Dele Sosimi (previously Fela's keyboardist) and his Afrobeat Orchestra. Before then vinyl collectors have the chance to get their hands on some limited edition 12" vinyl of the 'Sorrow Tears & Blood'. 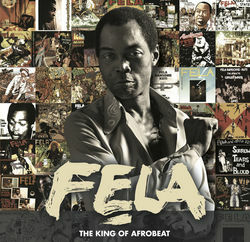 This record, to be released exclusively for Record Store Day on 20 April, includes the title track, the seminal ‘Sorrow Tears & Blood’, restored to its original, complete running time, following the recent rediscovery of the six-minute instrumental section preceding the entrance of Fela's vocals. The B-Side is the super rare ‘Perambulator’ which has been unavailable for decades. Knitting Factory Records are releasing specially repackaged versions of Fela Kuti’s complete works (over 50 albums) throughout 2013. The relaunch of the back catalogue started in March this year with 10 double albums, all re-packed and with in-depth track-by-track commentary from Afrobeat historian Chris May. This first batch was spearheaded by the new compilation The Best Of The Black President 2, a 2CD collection with a foreword written by Senegalese-American R&B/hip-hop artist Akon and track notes written by Chris May. A special deluxe edition of the compilation also includes a DVD of Fela's legendary 1984 Glastonbury concert. The reissues series continues with a second batch of 10 mostly double albums on 20 May, with a final batch scheduled for September 2013. Founded in 2002 as an offshoot of the celebrated Knitting Factory club in downtown Manhattan, Knitting Factory Records was rebooted in 2009 with the granting of a licence from the Fela Anikulapo Kuti Estate for the worldwide re-release of his catalogue. Today, Knitting Factory Records also encompasses the catalogues of Instinct Records, Shadow Records, Shimmy Disc, Evolver Records and Young One Records. In partnership with Partisan Records, a Brooklyn-based, artist-run label, Knitting Factory Records strives to honour the music of an eclectic array of relevant artists drawn from both the past and the present. The Knitting Factory group of labels, and arm of Knitting Factory Entertainment, is now making the journey across the Atlantic where, distributed by PIAS, it plans to introduce its artists to lovers of good music in the UK, Eire and throughout Europe, starting with the complete Fela Kuti catalogue re-issue.